Reserve now by clicking here! New Year’s Eve is slowly approaching, and it’s time to begin planning for Las Vegas’s biggest night out. You’ve picked out your dress or suit, you have a group of friends or a loved one to go out with, and you may have even secured your transportation already. But have you chosen a spot to eat? Don’t save your dinner plans for the last minute, because you’ll need some good, filling food in your belly to prepare for the rest of the night. At FIX, we’ll be hosting a four-course New Year’s Eve Gala Dinner, perfect for the decadent evening that is sure to ensue. To start, you’ll have a choice of Spicy Tuna with crispy rice and garlic ponzu, Kobe Chili Cheese Fries loaded with cheddar cheese, Crispy Calamari with creamy ponzu and sweet Thai chili sauce, FIX Buffalo Wings, and Lobster Tacos with grilled mango, cilantro, and avocado cream. Coming up next, you’ll have a choice of Roasted Tomato Soup with grilled goat cheese bacon sandwich, BLT Wedge with smoked bacon and creamy parmesan, or our Kale Caesar with romaine, white anchovy dressing, and parmesan cheese. Then comes the main event: A choice of Scallops Benedict with Applewood bacon, crab hollandaise, and shallot potato cake; Wood-Grilled Chicken with fingerling confit, bacon, and shallot; an 8 oz. Filet with black truffle and red wine jus; our classic Steak and Lobster with a 5 oz. Kobe short rib and 4 oz. Maine lobster tail; or our 14 oz. New York Steak with grilled asparagus and truffle jus. As if that wasn’t enough, we saved the best for last. Our dessert selection is a surprise, and will be chosen by Chef Erik Wepfer for the night. If you’re looking for the perfect place to enjoy dinner before your night of fun, look no further than FIX inside Bellagio. You’ll leave dinner with a full stomach and a happy heart, ready to take on the Las Vegas Strip, The Bank nightclub, or whatever else your plans may entail. 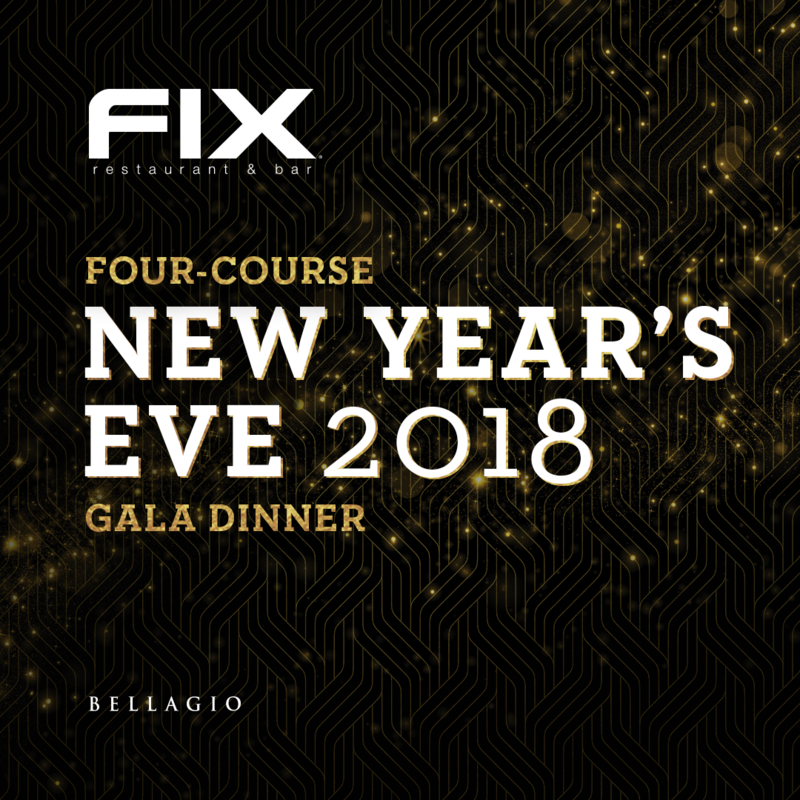 Don’t forget to make a reservation for New Year’s Eve in Las Vegas at FIX by clicking the bar at the top of this page!